On Thursday, March 15th, 2018 at 10am, Neal Mason, Pete Patterson, and Paul Viau presented "Construction Defects from the Developer/General Contractor Perspective." "Construction Defect Litigation from the Developer/GC Perspective" is the second webinar in our Construction Defect series. This program is compiled of a sequence of case studies in successful planning, analysis, and execution of expert work on behalf of developers and general contractors. Construction defect litigation can be expensive, confusing, and long lasting, but it doesn't have to be. 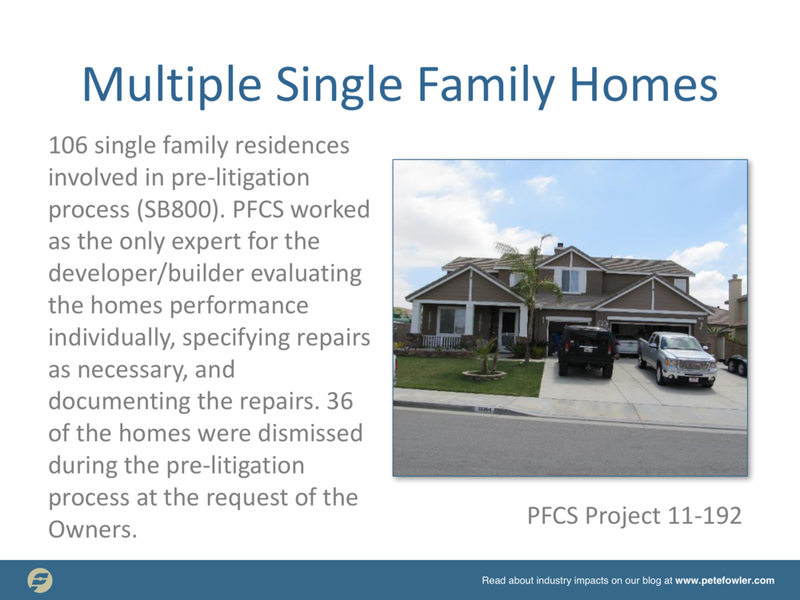 Through this presentation, we will break down the process from the Developer/GC point of view, and provide approaches and alternatives in construction defect litigation. This webinar will demonstrate how developer and general contractor litigation should be investigated and executed from an expert consultant perspective, using the most current ASTM standards and science-based building performance analysis. In preparing for trial, you want the highest level of professionalism in conducting building performance investigations. Investigations should involve conformance with the best standards of practice, a written investigation plan, random selection protocol for inspection and testing locations so the data is not biased, a comparison performance to perfection, realistic repair estimates, and allocations to trade contractors. This program will include real-life case studies applying various approaches to construction defect litigation matters and examples of good work. Gain a big-picture perspective on handling construction defect litigation from a developer or general contractor perspective. This presentation was given as a webinar on 3/15/2018 by Neal Mason, Pete Patterson, and Paul Viau.